Hosting an Easter party? Or want to add spring spark to a room? No matter the goal decorating for Easter is part of all the fun. But before you break out the cardboard bunny wall hanging you should try some new ideas. 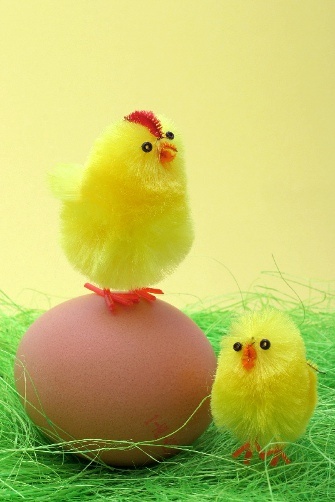 This holiday carries the essence of spring symbolizing rebirth. What could illustrate this are soft fun colors. You can decorate in a subtle way and still create the perfect atmosphere. Think of your house as a base and you’re just going to add a little taste of the season around to start. First add some festive color to your living area, for example put a few pastel colored pillows on your sofa or love seat. Purple and pink would really brighten the place up but not go over board. Then get pillar candles of the same colors or add a few more like pastel yellow or green. Now you have already created a more appropriate essence but you still haven’t had to hang the happy easter wall hanging. Now you can work with the bunny thing since that is the major Easter figure. You can get realistic looking bunnies that feel soft and look nice at an arts and crafts store or gift shops. Placing a few of these on the floor will add a nice touch. Before you go any further don’t forget to add some flowers real or fake to the living room. Daisies are simple and fun or any flower that makes you feel good. Adding a vase on the TV or fireplace can really bring everything together (it would serve a function better on the thing that is the focus of the room or at the center of eye view). Make sure you have some of the same shades of color you have already used in the room, for example pink, purple and yellow daisies. What about windows? This can be a whole other project. You can tuck some of your flowers on top of the window or if you feel creative you can get fake branches from a craft store. Once you have the branches you can rub some glue and dip them in a light sparkle dust. When they are dry you can fan them together tied by a white ribbon and tuck that above your window, or tie them laying sideways across the top of the window. When you start doing this part it will make more sense. This is especially beautiful when the sun is shining through. You can do this to every window in the house or your select few. Once you have finished, you can focus on the dining area. This is especially fun because your working with food as well, and you can add such a feel with the way you present the food. First off a good old fashion basket of colored eggs would be the perfect centerpiece to a buffet or table. If that isn’t creative enough for you, you can make a big nest or many little ones to place some eggs in; this is still traditional but not as common. Something guests will surely talk about. You could even go as far as making the nest deep enough to place bowls in so people could eat out of them. A table cloth is a minor but important detail. A fun idea is a hand painted table cover you can get a fabric piece of you selected color and paint flowers or if you’re really talented how about Peter Cottontail. Don’t clutter the tablecloth just randomly place the images depending upon your picture of choice. The flowers could be hanging off a vine that travels around the table. If you're not a good painter or you just don’t have the time, you could purchase a colorful tablecloth that includes all the colors you have chosen to decorate with, or if you have kids you can let them paint scenery on the fabric, this could be risky but bringing a child like quality to your décor could really work for Easter, after all it is a playful holiday. Now you can cover the dining chairs with covers in a color or in mismatch , this is elegant and you can tie it in with the tablecloth so if you hand painted the table cover you can use solid color covers for the chairs that bring out the table cloth.When you’re setting the table add little details, for example tying the napkins together with pink, yellow, purple, and green ribbons. Have a punch bowl with floating little ducks of different colors. This can be found at any party store or web site. You can even make your own ice cubes with little bunny or other Easter figures frozen in them or add petals of the closest flower. This is a more subtle but creative way to cause a buzz among quests. 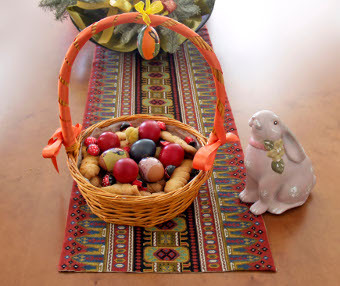 The point is if you add Easter to your presentation this will be most of your decorating in the dining area. Home for more interesting seasonal facts, gardening and flowers plus much more at Piglette.